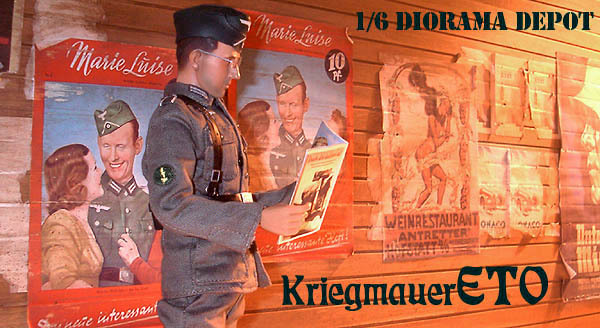 Display your 1/6-scale Wehrmacht, Heer, Fallschirmjager, Luftwaffe, Kriegsmarine, etc. 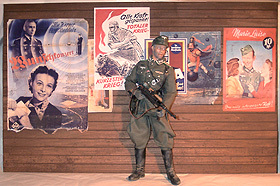 figures in front of these 15" x 24" custom backdrops. 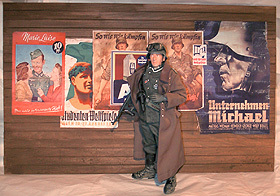 Or pose your victorious Allied troops taking their objective in the European Theatre of Operations. Either way, they're perfect for dioramas, photo shoots, and behind shelves. With minor effort, you can cut the wood panel down to fit any needs. 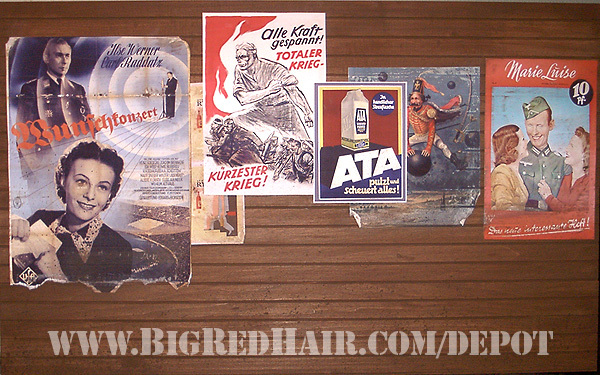 A movie poster for a romantic melodrama (Wunschkonzert, or Wish Concert) with the image of a dashing Luftwaffe officer, a german labor propoganda poster, an ad for "ATA", Baron Munchausen riding a cannonball, and an ad for a women's magazine showing a Wehrmacht private with frauleins. 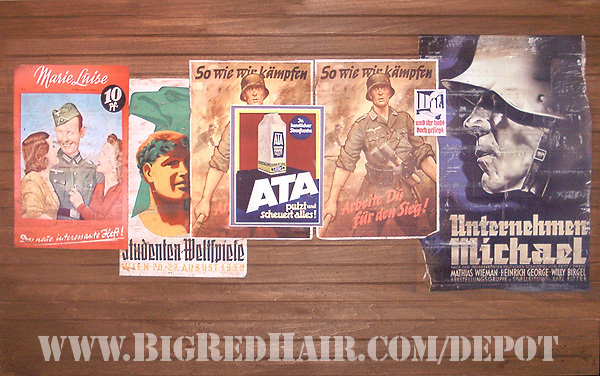 An ad for a women's magazine showing a Wehrmacht private with frauleins, a poster for a Hitler Youth rally, a poster featuring a wehrmacht NCO, and a movie poster (Unternehmen Michael, or Project Michael) with the bold silhouette of a German infantryman.